Lyons Press has just accepted Doug's newest book project--American Dragon: A Cultural Look at the Alligator. It should be published in early 2020. Doug is looking forward to speaking at the 2019 International Trails Symposium in Syracuse, New York. In January, 2019, Doug provided information and a lead quote for a Florida travel article in the Boston Globe. 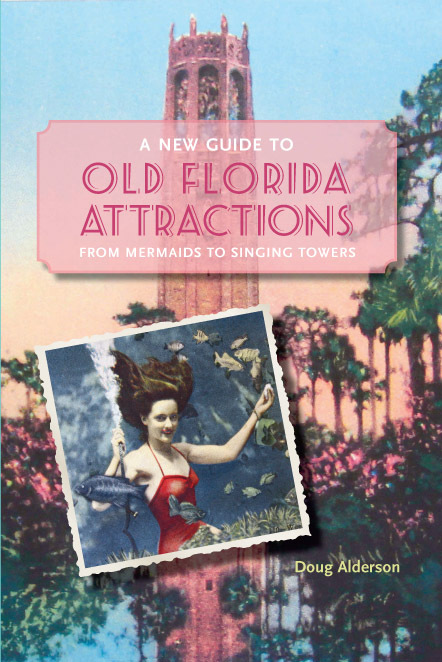 Doug's latest published book, A New Guide to Old Florida Attractions: From Mermaids to Singing Towers (Pineapple Press) won the first place royal palm literary award for published travel book at the 2017 Florida Writer's Association Conference in Orlando. It also received accolades for placing in the top five for published book of the year. The full color book has been receiving positive press coverage such as this article in the St. Augustine Record and a full-length feature by Gary White in the Lakeland Ledger and several other newspapers. His Marineland chapter is featured on FloridaRambler.com and an excerpt from his Bok Tower chapter is featured on the Burrow Press website. Phil Jason wrote a glowing review in the Naples Florida Weekly and other newspapers and Alexander Cendrowski wrote one for Saw Palm Journal. Many people are using the book to plan vacations! Doug volunteers to help to coordinate the highly successful Apalachicola RiverTrek, highlighting the plight of the Apalachicola River and Bay and raising funds for the Apalachicola Riverkeeper. Doug and co-leader Georgia Ackerman were featured on the Canoe & Kayak Magazine website. Support RiverTrek! Read the Tallahassee Democrat feature article Doug wrote about the 2018 RiverTrek. Since publishing his first free-lance magazine article at age eighteen, Doug Alderson's articles and photographs have been featured in Wildlife Conservation, American Forests, Sea Kayaker, Sierra, Mother Earth News, Native Peoples, Shaman's Drum, Campus Life, America, The Old Farmer's Almanac, The St. Louis Post-Dispatch, the Florida Naturalist, Florida Sportsman, Tallahassee Magazine, Florida Wildlife, AT Journeys, Rails to Trails and several others. He has 13 published books (see below) and has won several state and national writing awards for his books, short stories, and magazine features. He is also an adventurer, having hiked the entire Appalachian Trail, coordinated a group walk across the United States, backpacked through Europe, and mapped a 1,500-mile sea kayaking trail around Florida. Doug has been a featured speaker at symposiums, writer's conferences and book fairs, including the Miami Book Fair International. He has been featured in media outlets such as the New York Times, National Geographic website, Boston Globe, and Adventure Kayak magazine for his writing and trail work. 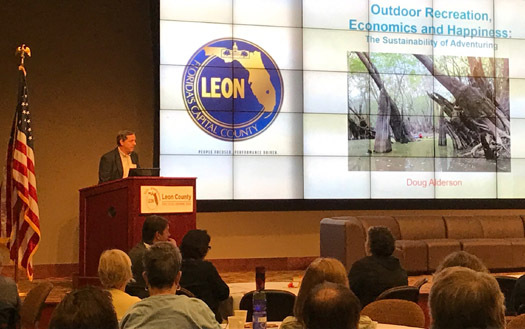 Paddle Florida presented Doug their inaugural Environmental Service Award in 2015 "for conspicuous commitment, unflagging dedication and love of Florida's natural environment." A New Guide to Old Florida Attractions takes readers on an unforgettable journey across the Sunshine State, exploring the history of Florida tourism and featuring 38 attractions still open to the public. Discover what Florida's golden age of tourism was, and still is, all about― magical, beautiful and fun! This book is in full color. Wild Florida Adventures covers journeys on both land and water with useful how-to information at the end of each chapter. From kayaking the length of the Florida Keys to searching for record-sized trees in a huge swamp to meeting the famous naked man of the Santa Fe River, this complementary sequel to Wild Florida Waters takes readers into Florida's unique places. The book won a 2014 first place royal palm literary award in the travel book category from the Florida Writers Association. Conor Mihel of Canoe & Kayak Magazine calls it "a compelling glimpse of Florida." Simon's Wondrous Garden and Other Stories chronicles the life of an Atlanta attorney who begins having paranormal experiences after a car accident. Reaching back to his farm roots, he is inspired to turn his manicured suburban yard into an odorous vegetable garden, provoking the wrath of his wife and neighbors. What follows is both humorous and profound. The Great Florida Seminole Trail (Pineapple Press 2013) is the first comprehensive illustrated guide to Florida's historic and cultural sites that directly relate to Seminole Indians. The span of Seminole history covered in the book ranges from William Bartram's visits to Seminole villages in the early 1770s to the tragic Seminole wars to contemporary Seminole attractions. Also available on Kindle. 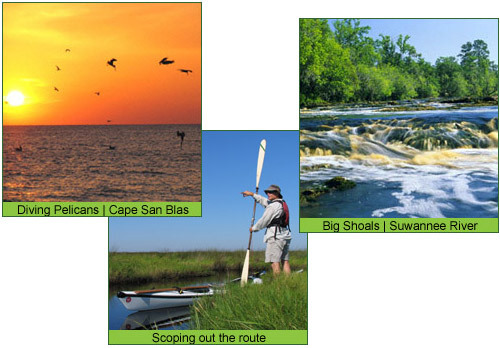 Wild Florida Waters: Exploring the Sunshine State by Kayak and Canoe places Florida's unsurpassed beauty and abundant wildlife in the forefront, from the mangrove labyrinth of the Ten Thousand Islands to the springfed Ichetucknee River. It includes an exciting dose of paddling adventures along with useful how-to information. Available on Amazon and at select retailers! It received second place awards from the Florida Outdoor Writers Association and Florida Writers Association. Doug read from his book on the WFSU television show Dimensions. Donna Meredith reviewed the book in the Southern Literary Review. Seminole Freedom is a novel based on true historical events. Following the life of Jenny as she grows into womanhood and endures the long and bitter Seminole wars, this tale of hardship, bravery and freedom explores the little known role of Black Seminoles in the shaping of American history. Also available on Kindle. Encounters with Florida's Endangered Wildlife (University Press of Florida, 2010) features chapters tracking panthers, black bears, whooping cranes, manatees, sea turtles, even ivory-billed woodpeckers. This book is a must-read for anyone who wants to know more about wild Florida. Now available on Kindle! Through Time and National Parks: Doug sets out to retrace his grandparents' 1939 western journey with a burning question: are the panoramic landscapes, especially those found in our national parks, as relevant and captivating today as they were more than 75 years ago? Also available on Kindle. The Ghostly Ghost Tour of St. Augustine and Other Tales from Florida's Coast: Where else but Florida can you find a greater treasure-trove of tales filled with pirates, shipwrecked sailors, ghostly sea captains and lost tribes of Native Americans? Also available on Kindle and audio. New Dawn for the Kissimmee River: Orlando to Lake Okeechobee by Kayak (University Press of Florida, 2009) uses a 12-day expedition to highlight the ongoing restoration of the Kissimmee River. It was first place awards from both the Florida Writers Association and Florida Outdoor Writers Association. The Vision Keepers: Walking For Native Americans and the Earth, which covers Doug's walks and experiences with Native American people, was released in April of 2007 by Quest Books of Wheaton, Illinois. It has recently been translated into Russian. The Ghost Orchid Ghost and Other Tales From the Swamp, a collection of original Florida mysteries and ghost stories, was released in 2007 by Pineapple Press. The book serves as a unique way to teach young people about Florida's history and environment through storytelling. Doug's first book, Waters Less Traveled: Exploring Florida's Big Bend Coast (University Press of Florida), chronicles a 9-day sea kayaking adventure along a Gulf Coast wilderness. Salty characters, colorful history and amusing tales are all included. The book was the runner up for Best Travel Book of 2006 by the North American Travel Journalists Association. Doug is a proud member in these organizations: Florida Writers Association, Tallahassee Writers Association, Florida Paddling Trails Association and the Apalachicola Riverkeeper. Doug enjoys doing book signings, PowerPoint programs and guiding groups in the outdoors. For events outside of the Tallahassee area, an honorarium is requested to cover travel expenses. Contact Doug for a complete list of programs he offers, dougalderson@comcast.net. Doug is an accomplished photographer specializing in nature photos. He is interested in sharing the timeless beauty of land and water with his audience. A few of his photos are shown below. You can view more of Florida's landscapes, plants and animals here. His photos are also featured in a gallery on the 1000 Friends of Florida website. Doug won contest categories in the 2007, 2011, 2013, 2014, 2015, 2016, 2017 and 2018 National Recreation Trails photo contests.